The Reflex LED seamless sports floor is an exciting concept in sports floor design. 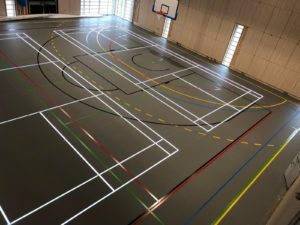 With a huge range of design possibilities, the Reflex LED sports floor includes games lines that can be turned on and off using a smart device. The facility shown above has badminton, football, dodgeball and activity lines which can be selected depending on the activity. The LED lines are embedded within the floor, creating a seamless, even finish to the surface. This makes the floor a beautiful, safe and unique way to encourage additional participants to a facility. Please contact us on 01932 563138 to discuss your project in more detail. Do you have a question? or need to chat through a specific spec / not sure what you are looking for?